Joe is a 30-year veteran standup comedian who has been on The Late Show with David Letterman, The Late Late Show on CBS multiple times, his own 1/2 Hour Special on Comedy Central, was a regular on the Chelsea Lately Round Table, received a standing ovation from all 4 celebrity judges and the 2,000 audience members on Americas Got Talent, and has two 1-hour specials “Medicated” and "The Poster's Wrong" that are both currently on Amazon Prime to watch for free if you have Prime. Joe has been medicating his severe anxiety that created many anger outburst in his life and in his career causing him to loose gigs, mess up relationships with people, and caused friction in his marriage early on. Joe has found being on SSRI's for the last 10 years life changing in a positive way. Joe also saw a psychiatrist and was diagnosed with ADD and was prescribed Adderall. Joe's been taking that for the last 3 years and feels that has also helped him tremendously with his life. In this podcast Joe will share his day to day life in a very candid way, giving his fans a much more up close and personal side of what makes Joe Matarese tick. 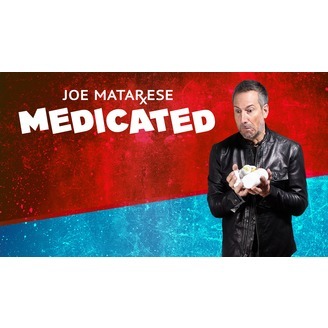 Enjoy "Medicated" The Joe Matarese Podcast. I'm back to podcasting after a very long break. I miss you all and hope to continue these podcast weekly. I'm also video taping these and will be posting some stuff on my social media of me in action. Remember Instagram.com/TheJoeMatarese is most important and the best way to follow me! Talk to you all again soon!